Vesperae solennes de Confessore KV 339 composed by Wolfgang Amadeus Mozart (1756-1791). Edited by Karl Gustav Fellerer; Felix Schroeder. For voice/mixed choir/orchestra. This edition: Paperback, Urtext edition. Paperback. Kirchenmusik, Klassik (Sacred, Classical). Level 3. Score. Language: Latin. KV 339. 80 pages. Duration 29 minutes. 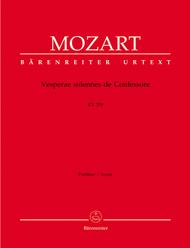 Published by Baerenreiter Verlag (BA.BA4894).ISBN 9790006459698. With Language: Latin. Kirchenmusik, Klassik (Sacred, Classical). 31 x 24.3 cm inches.